For 10 years, we’ve partnered with Korle-Bu Teaching Hospital in Accra to provide treatment to children who would otherwise not have it. With many children coming from remote and rural areas of the country, Transforming Faces also provides travel and accommodation expenses for children requiring treatment and rehabilitation. Today, we revisit a patient who was treated in 2011. Alimatu Shaibu was spotted at Tudu market, in the heart of Accra, by Mary Yirenkyi, the Project Administrator. Alimatu’s parents are farmers and the children assist on the farm. Like all her eleven siblings, Alimatu has no formal education because her parents do not have the resources to pay her school fees. Alimatu migrated to Accra with one of her sisters to seek greener pastures and she works as a porter, called kayayoo, in the local language. They live and ply their trade in the Konkomba market in a rented wooden structure, where most of the kayayee (plural for kayayoo) live. Mary decided to converse with her upon seeing her at the market to find out more about her but Alimatu was scared, because of a language barrier. In Ghana, there are nine government-sponsored languages, but many more local dialects also exist. 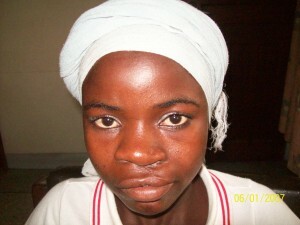 Alimatu could not speak any other language apart from her native tongue, which unfortunately Mary did not understand. Mary then met Alimatu’s sister and Mary had the opportunity to counsel and convince them that cleft lip and palate is a condition that can be corrected through surgery and rehabilitation. They were worried that Alimatu would have to miss a day from work, which would mean a serious reduction in their household income and availability of meals. Mary explained to them that the treatment is a process and that she has to undergo a series of examinations before she would be given a date for the surgery. She expressed her interest to do the surgery but complained of her lack of funds and the fact that she did not have the national health insurance card. Mary assured her of full sponsorship including travel expenses, food and other costs. On December 20, she agreed to follow Mary to the hospital for an initial intake session. 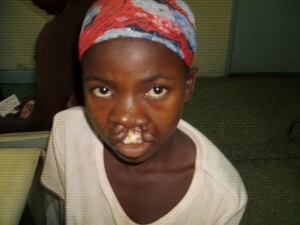 Alimatu underwent surgery on January 20, 2011. She has, since her surgery, received follow up care from the team. For more on our project in Ghana, click here.